Kinmar Security Nuts provide a secure and permanent fastening, are suitable for high torque applications and require a special matching driver tool for installation. A Kinmar Removable Nut version is also available, which requires a different type of tool to the standard Kinmar Driver Tool, but can be installed or removed with the appropriate matching driver. 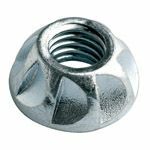 Kinmar Nuts are "One-way" security nuts that are designed to provide a secure and permanent fixing. The nut is installed using a special Matching Security Driver Tool, whilst the multi faceted drive head makes this nut suitable for high torque applications, and also allows the nut to be re-torqued post installation if required. 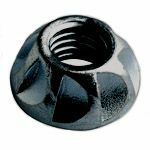 Ideal for indoor or outdoor projects, the Kinmar Permanent Nut is available in a choice of materials including BZP, Galvanised and Stainless Steel, so you are guaranteed that there is one suitable for any application you have where you need to fix something in place that you will not need to move again. ...however subject to MOQ and manufacturing lead-time, any size can be made to order.